The idea here is that if D(t) has a local extremum at t=tt and if D(tt)=r (the radius of the circle) then tt corresponds to a tangent point. So the plan is to solve dD/dt=0 to get values of tt, and then solve D(tt)=r to get the relation between a and b required for tangency. which I think can be solved in the sense that it can be converted to a cubic in cos t. Ah, no thanks. For case [i], plug sin t=0 and cos t=±1 into the formula for D and set it equal to r, and the legal (positive) values for a are |xc+r| and |xc–r|. 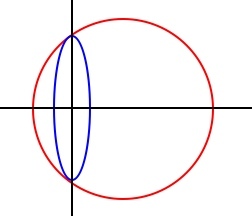 Obviously if a has either of these values then the left or the right end of the ellipse will be tangent to the circle. To find out if it’s exterior or interior requires checking whether the extremum is a minimum or a maximum, for which you need the sign of the second derivative. I haven’t gone there yet. It looks messy. Here r is 5, b is 4, so |xc| must be less than 3 (and it’s about 2.9). Of course in the limit as the ellipse becomes infinitesimally narrow, xc approaches 3 with the tangent point going to (0, 4) and xc, the origin, and the tangent point approaching a right triangle. Once again, for case [ii] generally, one has to test whether the extremum is a minimum or a maximum to determine if the tangent is interior or exterior. I wonder how horrible that is. I don’t want to find out right now.